Haq's Musings: Pak Lady Health Workers "Best in the World"! “It’s one of the best community-based health systems in the world,” said Dr. Donald Thea, a Boston University researcher, talking about Pakistan's Lady Health Workers Program. Thea is one of the authors of a recent Lancet study on child pneumonia treatment in Pakistan. He talked with the New York Times about the study. Published in British medical journal "The Lancet" this month, the study followed 1,857 children who were treated at home with oral amoxicillin for five days and 1,354 children in a control group who were given standard care: one dose of oral cotrimoxazole and instructions to go to the nearest hospital or clinic. The home-treated group had only a 9 percent treatment-failure rate, while the control group children failed to improve 18 percent of the time. 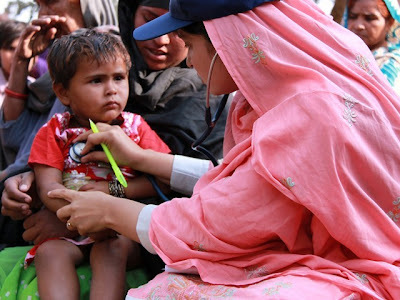 Launched in 1994 by former Prime Minister Benazir Bhutto's government, Pakistan’s Lady Health Workers’ program has trained over 100,000 women to provide community health services in rural areas. The program website introduces it as follows: "This country wide initiative with community participation constitutes the main thrust of the extension of outreach health services to the rural population and urban slum communities through deployment of over 100,000 Lady Health Workers (LHWs) and covers more than 65% of the target population. The Programme contributes directly to MDG goals number 1, 4, 5 & 6 and indirectly to goal number 3 & 7. The National Programme for Family Planning and Primary Health Care is funded by the Government of Pakistan. International partners offer support in selected domains in the form of technical assistance, trainings or emergency relief." A recent comprehensive review of the program found that as compared to communities not served by the LHWs, the served households were 11% more likely to use modern family planning methods, 13% were more likely to have had a tetanus toxoid vaccination, 15% more were likely to have received a medical check-up within 24 hours of a birth, and 15% more were likely to have immunized children below three years. The improvements in health indicators among the populations covered by the LHWs were not entirely attributable to the program alone; researchers noted that other positive changes such as economic growth, increased provision of health services and better education services helped to enhance the impact. While the program had managed to sustain its impact despite its large expansion, evaluators found that serious weaknesses in the provision of supplies, and equipment and referral services need to be urgently addressed. The program is now a major employer of women in the non-agricultural formal sector in rural areas, and is being more than doubled in size if budget allocations can be sustained. If universal coverage is achieved, every community in the country will have at least one lady health worker, one working woman and potential leader, who could serve as a catalyst for positive change for women in her community. The health officials say that unlike the mid-1990s when it was difficult to recruit women because of the minimum 8th grade education requirement, now there are large numbers of women who meet the requirement lining up for interviews in spite of low stipend of just Rs. 7000 per month. Private sector is also helping the LHW program. Mobile communications service provider Mobilink has recently partnered up with the United Nations Population Fund (UNFPA), Pakistan's Ministry of Health (MoH) and GSMA Development Fund in an innovative pilot project which offers low cost mobile handsets and shared access to voice (PCOs) to LHWs in remote parts of the country. Mobilink hopes to bridge the communication gap between the LHW and their ability to access emergency health care and to help the worker earn extra income through the Mobilink PCO (Public Call Office). Due to economic downturn and security challenges in several conflict areas since 2008, Pakistan's chances of achieving its Millennium Development Goals (MDGs) by 2015 appear to be slim. However, significant timely expansion in the LHW program and making it more effective can still help Pakistan get close to its MDGs on important health indicators like the infant mortality rate (IMR) and the maternal mortality rate (MMR). The government says it is committed to slowing population growth, which it referred to in a report last year as a “major impediment to [Pakistan’s] socioeconomic development process.” But public health experts say they have seen little beyond lip service. In rural areas, access to family planning services is limited and hampered by deteriorating security, while government health workers are overburdened. International donors want bang for bucks, and working in the countryside is more expensive, said Mohsina Bilgrami of the Marie Stopes Society in Pakistan, another nongovernmental organization. Shahid keeps her message basic. In one colorful illustration she shows on home visits, grimy children wail in a tattered house. In another, a mother shakes a rattle at a baby, a father frolics with a toddler and a child reads a book in a tidy dwelling. Intrauterine devices can help make the second picture a reality, she says. In urban, middle-class areas, the message is slowly resonating. Two hours away, in the city of Mirpurkhas, a similar discussion with women and a few mothers-in-law sparked boisterous discussion. Several said children were simply too expensive. “If it’s a sin, there shouldn’t be doctors who offer it,” one said of contraception, eliciting nods. At a private clinic in Mirwah, a woman named Buri, 35, said firmly that a small family is best. But it was too late: Married at age 13, she was pregnant 12 times before she opted for tubal ligation, a sterilization procedure. Ten of her children lived. None attends school. Next to Buri lay her sister-in-law, silently shivering under a floral sheet, in labor with her first child. Presiding over the scene was their mother-in-law, a woman in ornate silver jewelry, who matter-of-factly stated that the newborn should be the first of at least eight. PESHAWAR, Mar 4 2012 (IPS) - With no money to see a doctor, Gul Lakhta,50, had resigned himself to blindness when a ‘mobile hospital’ drove into his village in the Bajaur Agency of the Federally Administered Tribal Areas (FATA), on Pakistan’s rugged border with Afghanistan. “They operated on me the same day. Now, my eyesight is excellent,” says Lakhta, a beneficiary of the Mobile Hospital Programme (MHP) started by the government in 2003 to provide healthcare to people in the war-torn areas of northern Pakistan. After the United States-led coalition forces toppled the Taliban government in Afghanistan in 2001 its leaders fled across the border to the FATA and adjacent areas, bringing with them their fundamentalist ideology and culture of violence. Before long, the Taliban had unleashed a campaign of bombings against their hosts, targeting schools, health facilities, markets, government buildings and forces, bringing life to a virtual standstill in the seven agencies that make up the FATA. “In the process, Taliban militants also destroyed 60 health facilities, forcing patients to travel to Peshawar and beyond to seek treatment for even minor ailments,” said Dr Niaz Afridi, head of the MHP in the FATA. The government allocates Pakistani rupees 60 million (660,000 dollars) per year for the programme and there are plans to expand it, Afridi said. These clinics-on-wheels have proved a blessing for the patients because they are well-equipped and manned by dedicated teams. Currently they provide treatment to 90,000 patients annually. “We also organise medical camps in areas which are inaccessible by the regular medical workers and our medical teams visit the remotest areas to reach the patients and provide diagnosis and treatment free,” Afridi said. Dr Nauman Mujahid, development officer for health services in the FATA, said the MHP is manned by a staff of 150, including physicians, surgeons, gynaecologists and other specialists like ophthalmologists and dentists. Each vehicle is equipped with a generator that powers a mobile operation theatre, a dental unit, x-ray and ultrasound machines and laboratories that allow for quick diagnostics. “Critically-ill patients who require hospitalisation are referred to tertiary care centres in Peshawar,” said Mujahid. The programme started with the South Korean government donating 14 mobile clinic units in 2003 to help the people in the insurgency-hit areas of the FATA. Although the process of the rebuilding damaged health outlets is in progress, the MHP will, because of its popularity, continue to operate in the FATA with a fleet that was augmented in 2010 by the government. Mobile hospitals are particularly effective in ensuring that patients who need to be on drug regimens lasting several months get their doses. This is especially so in the case of tuberculosis (TB) patients who, if improperly treated, can develop drug resistant strains that can endanger a community. Waqar Ali, 46, who was diagnosed with TB at a free medical camp in North Waziristan three months ago, is now on medication he must take for eight months. “I am feeling better and do my farming like normal people,” he told IPS. Authorities take care to notify people in areas where the camps are going to be held about a week in advance. Often announcements are made from the mosques. Researchers working for the Pakistani government developed an early epidemic detection system for their region that looked for telltale signs of a serious outbreak in data gathered by government employees searching for dengue larvae and confirmed cases reported from hospitals. If the system’s algorithms spotted an impending outbreak, government employees would then go to the region to clear mosquito breeding grounds and kill larvae. “Getting early epidemic predictions this year helped us to identify outbreaks early,” says Umar Saif, a computer scientist at the Lahore University of Management Sciences, and a recipient of MIT Technology Review's Innovators Under 35 award in 2011. An alliance of Pakistani clerics will hold demonstrations across the country against the killings of polio eradication campaign workers, leaders said on Thursday, as the death toll from attacks this week rose to nine. Tahir Ashrafi, who heads the moderate Pakistan Ulema Council, said that 24,000 mosques associated with his organization would preach against the killings of health workers during Friday prayers. "Neither Pakistani customs nor Islam would allow or endorse this. Far from doing something wrong, these girls are martyrs for Islam because they were doing a service to humanity and Islam," he said. Ashrafi's words are a clear signal that some of Pakistan's powerful clergy are willing to challenge violent militants. Gunmen on motorbikes have killed nine anti-polio campaign workers this week, including a man who died of his wounds on Thursday. Some of the dead were teenage girls. Following the violence, the United Nations pulled back all staff involved in the vaccination campaign and Pakistani officials suspended it in some parts of the country. "The killers of these girls are not worthy of being called Muslims or human beings," said Maulana Asadullah Farooq, of the Jamia Manzur Islamia, one of the biggest madrassas, or religious schools, in the city of Lahore. "We have held special prayers for the martyrs at our mosque and will hold more prayers after Friday prayers tomorrow. We also ask other mosques to come forward and pray for the souls of these brave martyrs." It is not clear who is behind the killings. Pakistani Taliban militants have repeatedly threatened anti-polio workers, saying the vaccination drive is a Muslim plot to sterilize Muslims or spy on them. But they have denied responsibility for this week's shootings. Suspicion of the campaign surged last year after revelations that the CIA had used the cover of a fake vaccination campaign to try to gather intelligence on Osama bin Laden before he was killed in his hideout in a Pakistani town. But many of Pakistan's most important clerics have issued fatwas, or decrees, in support of the polio campaign. Muslim countries like Saudi Arabia encourage vaccinations against polio, which can kill or paralyze within hours of infection. The disagreement between some clerics and militants may be indicative of a wider drop in support for militancy in Pakistan, said Mansur Khan Mahsud, director of research at the Islamabad-based think-tank the FATA Research Center. Opinion polls the centre carried out in ethnic Pashtun lands on the Afghan border, known as the Federally Administered Tribal Areas (FATA), showed support for the Taliban dropping from 50 percent 2010 to about 20 percent in May 2012. Mahsud said many people had welcomed the Taliban because they believed Islamic law would help address corruption and injustice. But as the Taliban began executing and kidnapping people, some turned against them. In a widely publicized incident in October, Taliban gunman shot a 15-year-old schoolgirl campaigner for girls' education in the head and wounded two of her classmates. Schoolgirl Malala Yousufzai survived and the wave of condemnation that followed the attack prompted the Taliban to release statements justifying their action. The killings of the health workers struck a similar nerve, Ashrafi said. The girls got a small stipend for their work but were motivated to try to help children, he said. "You think they went out to administer the drops despite the threats and risked their lives for 200 rupees ($2) a day? They were there because of their essential goodness," he said. "Imagine what the families are going through." Kudos to the brave workers carrying out the vaccination campaign. It's because of their service that polio cases in Pakistan significantly declined from 198 in 2011 to 57 in 2012. ISLAMABAD - In year 2011-12, Pakistanis used 149.278 million condoms, 6.223 million cycles of oral pills, 1.315 million insertions of internal uterine devices (IUDs) and 2.705 million vials of injectables, revealed a report released by the Pakistan Bureau of Statistics (PBS). The PBS report showed an unprecedented rise in the use of condoms as a contraceptive tool during the year 2011-12 as compared to last year. The Federally Administrated Tribal Areas (FATA) witnessed a 60 percent increase in the use of condoms while the federal capital stood second with a rise of 27.9 percent. In Khyber Pakhtunkhwa, the ratio of using condoms as a contraceptive tool remained 24.5 percent while Sindh showed a rise of 20.7 percent. In Punjab, rise in the use condoms was recorded at 18.7 percent. However, according to the report made available to Pakistan Today, a contradictory trend was witnessed in Balochistan, Gilgit-Baltistan and Azad Jammu and Kashmir where the use of condoms as a contraceptive tool saw a decline in the year 2011-12. Balochistan recorded a decrease of 11.8 percent in the trend of using condoms as a contraceptive tool whereas the popularity graph of condoms fell down in Gilgit-Baltistan where a decrease of 5.4 percent was recorded. In Azad jammu and Kashmir, there was a decrease of 1.3 percent in the use of condoms. For oral pills, the report showed that FATA remained at the top with an increase of 46.2 percent in their use followed by Gilgit-Baltistan with a rise of 20.8 percent and the third place was occupied by Khyber Pakhtunkhwa with 12.0 percent. In federal capital, the use of oral pills as a means of contraception showed a rise by 4.5 percent, Punjab 3.2 percent and Sindh showed a rise of 2.1 percent. Again in the case of Balochistan, the use of oral pills was discouraged by locals. The report showed that the use of oral contraceptive pills had decreased by 21.3 percent. The province/sector-wise comparison of contraceptive performance during the financial year 2011 -12 in terms of Couple Year of Protection (CYP) – an international indicator for data collection – has been made with the previous year 2010-11 which showed that at the national level, an increase of 0.7 percent had been observed for all programme and non-programme outlets during 2011-12 as compared with 2010 -11. As far as the district Islamabad and FATA are concerned, the contraceptive performance for the financial year 2011-12 compared with 2010-11 depicted an increase of 19.5 percent and 37.4 percent respectively, whereas a decrease of 2.9 percent and 12.0 percent had been recorded in AJK and Gilgit-Baltistan. The Asian Development Bank (ADB) has announced $ 200 million assistance for Benazir Income Support Program (BISP) so that it may reach out to the families not benefiting its various schemes. The announcement was made recently while a delegation of the bank was visiting the country with a special objective to look into the areas where the social safety, extended over the poverty-stricken people of the country four years back could be helped out. Due to transparency and effective utilization of the funds, BISP has received direct technical and financial support from international donors. World Bank, Asian Development Bank (ADB), UK Department for International Development (DFID), USAID, China, Turkey and Iran has doled out funds to support different BISP initiatives. Some countries in the Asian regions, including India, have approached Pakistan for replicating BISP model. BISP conducted countrywide Poverty Survey/Census for the first time and collected the data of almost 180 million people and 27 million households using GPS devices for the informed decision making (to cope with natural disasters and other emergencies). The poverty census completed in record time of one year across all Pakistan including Azad Jammu & Kashmir, Gilgit-Baltistan and FATA. BISP took start with Rs34 billion (US $ 425 million approximately) for the financial year 2008-09 aiming to cover 3.5 million poorest of the poor families. The allocation for the financial year 2012-13 is Rs. 70 billion to provide cash assistance to 5.5 million families, which constitutes almost 18% of the entire population. The Program aims to cover almost 40% of the population below the poverty line. More than 7 million beneficiary families have been identified through Poverty Scorecard Survey for disbursing Rs1000/month through ‘branchless banking system’ (Smart Card, Mobile Phone, and Debit Card). Called as Martial Plan and having focus on poverty alleviation through empowering the women, BISP has so far disbursed more than Rs146 billion to the deserving and needy of the country with complete transparency in about 4 years time through the elected representatives of the people, regardless of their party affiliation. Waseela-e-Haq provides interest free loans up to Rs 300,000 to help recipients set up small businesses. The most striking feature of this program is that the female beneficiary is the sole owner/proprietor of the business and the counseling, monitoring and training for starting the business is provided through Pakistan Poverty Alleviation Fund (PPAF). Waseela-e-Rozgar has been launched for provision of demand-driven technical and vocational training to the deserving youth, who do not have any skill, through public/private training institutes. A total of 10,000 young males and females have been trained and another 20,000 are currently undergoing training. The target is to train 150,000 students every year. Besides helping the poor and the marginalized sections of the society in terms of income support and skill development, the BISP is providing insurance cover of Rs.100, 000 in the case of the death of the bread earner of the poor family registered with the authority. With a view that health shocks are the major reason for pushing people below the poverty line, Rs25000 health insurance is being provided to the poorest families for the first time in Pakistan. Pilot phase has been launched from Faisalabad. Karachi: Pakistan’s largest city and commercial centre, Karachi, is a city of extremes where the richest live alongside the country’s poorest. Perfectly coiffed women with foreign degrees and fancy handbags tour around the city’s designer malls. At the other end of the spectrum, a range of hurdles leave women from the poorest sections of society struggling to access basic services, particularly healthcare. But a recently launched telehealth service is hoping to change that by giving women in Karachi, Pakistan’s largest city with a population of around 18 million, access to basic health advice for free from a mobile phone. “This is a big opportunity to improve access to woman in urban areas who have no access to basic healthcare and information, particularly during pregnancy,” says Zahid Ali Fahim, head of the telehealth service run by the Aman Foundation, a Pakistan-based non-governmental organisation. Dr Fahim oversees the 26-seat call centre that has been working around the clock for the past 18 months. According to the World Health Organisation’s Global Health Observatory report, 40 per cent of premature deaths in adults in Pakistan would have been preventable through early intervention. Though there is no official WHO breakdown by gender, experts say a significant portion of those premature deaths are women. Distance to hospitals and clinics, the cost of transport, and low levels of trust in government-run services leaves men and women unable to seek the medical help they may need. A strict social code for many women presents an additional obstacle. Low literacy rates — 57 per cent of women are illiterate in Pakistan compared with 26 per cent of men — and a lack of basic health knowledge compound the problem. When women are able to travel to a clinic or hospital, they are usually accompanied by a male relative, leaving many unwilling — or unable — to explain their medical problem to the doctor. 1. Pakistan's infant mortality rate is ranked 26th worst in the world. 2. Pakistan remains high though it has been coming down from 138 per 100,000 in 1990 to 112 in 2000 to 86 in 2012. 3. Pakistan is among the five countries (India 22%, Nigeria 13%, Democratic Republic of Congo 6%, Pakistan 6% and China 4% in that order) across the world where half of all under-five deaths occur. 4. The report recommends exclusively breastfeeding all newborns till six months of age, immunizing children and newborns with all recommended vaccines, and eliminating all harmful traditions and violence against children. To ensure children grow up in a safe and protective environment. Besides this feed children with proper nutritional foods and micronutrient supplements, where available, and de-worm children; give oral rehydration salts (ORS) and daily zinc supplements for 10-14 days to all children suffering from diarrhea. Antenatal and postnatal care for women in rural Pakistan has improved dramatically, thanks in part to the work of women like Shagufta Shahzadi, a skilled birth attendant trained under a UNICEF-supported programme. KASUR DISTRICT, Pakistan, 3 December 2014 – “My biggest pleasure is to see that the mother and child are both healthy after the delivery,” says Shagufta Shahzadi, 30, a skilled birth attendant (SBA) who lives and works in Nandanpura village, Kasur district, in Pakistan’s Punjab province. A day’s work for Shagufta could include delivering a baby, advising pregnant women on prenatal care, walking to the neighbouring village to provide postnatal care to a mother and the newborn. She takes a lot of pride in her work and feels a sense of achievement in the fact that due to her services, there hasn’t been a case of a pregnant mother or newborn death in her area over the last year. Shagufta believes that ensuring health and safety for mother and child is imperative. From 8am to 4pm, 25-year-old Samina Khaskheli travels door-to-door in rural Pakistan handing out free samples of condoms, birth control pills, and intrauterine devices. “I was told ‘This is sinful’,” Samina says about the initial opposition to her selling birth control. She took the job warily. Her off-the-map village, Allah Bachayo Khaskheli, is home to roughly 1,500 people in the country’s south-eastern Sindh province. The flatlands are covered by livestock, and economic desperation leaves women toiling alongside men as farmhands, livestock breeders and cotton pickers. Samina is a worker for the Marginalised Area Reproductive Health Viable Initiative – Marvi – once a popular emblem of female independence in Sindhi folklore. Today, Marvi refers to a network of literate or semi-literate village women aged 18 to 40 who travel door-to-door selling contraceptives. “In our village, there was no information about family planning. Many women died during childbirth,” says Samina about what inspired her to join. Trained by the Karachi-based Health and Nutrition Development Society (Hands), roughly 1,600 Marvis are dispersed throughout Pakistan’s remotest villages, where government healthcare facilities are scant or nonexistent. In the Sanghar district where Samina’s village is located, at least 400 Marvis fill a gap left by a lack of government funded lady health workers (LHWs). Pakistan’s contraceptive prevalence rate is low – out of a population of more than 190 million, only 35% of women aged 15-49 use contraception. Nevertheless, demand is high in rural areas, where women give birth to an average of 4.2 children, compared to 3.2 children in cities. “In villages, electricity is not there and health facilities are not there, but the need for contraceptives certainly is,” says Dr Talat Abro, the deputy secretary of reproductive health service for Sindh’s population welfare department. Marvi workers receive a six-day initial training by Hands and have their sessions in the field supervised by LHWs. Marvis emerge from the underserved populations they work with, so understand how family planning is best presented to the women they target. “I wish I had learned about birth control 15 years ago,” says Azima Khaskheli, a 45-year-old livestock breeder in Allah Bachayo Khaskheli village, her black bangles clinking together as goats bleat nearby. “We are not trying to limit the number of children – a woman or a family has a right to choose as many number of children as they want, but they must keep in mind the pregnancy period is important for a woman’s health,” says Anjum Fatima, the general manager for health at Hands. Opposition to birth control in Pakistan often takes on a religious hue, so Marvis are trained to sensitise local religious leaders on the health benefits of family planning. The Marvi programme relies on community mobilisers – ranging from religious leaders to influential landlords – to communicate the benefits of contraceptives. In 2014, approximately 40 Islamic religious leaders approved birth spacing for women in Pakistan. Samina adds that she enjoys the support of the village’s maulvis, or religious authorities, who endorse her door-to-door campaign, and never issue anti-contraceptive messaging over the mosque’s loudspeakers. Rotary conducts trainings for Lady Health Workers (LHWs) on cell phone reporting at its Rotary Resource Center in Nowshera, Khyber Pakhtunkhwa. “I was the only female at the time the program started, and I’ve been involved for the past eight years,” says health worker Malkabalees. Today, Rotary has trained more than 500 LHWs. Specific codes are assigned to various maternal, newborn and child health indicators (pregnancies, deliveries, newborn deaths, maternal deaths, etc) and immunization indicators (immunizations administered, refusals, missed children, etc). Community midwives and female health workers collect the data, and send it using specific codes to a server through SMS. Government and polio eradication leaders use the data to assess trends and gaps in the program. Lady Health Worker Malkabalees teaches a fellow health worker to report a refusal, and enter the reason (e.g. religious, fear, lack of understanding). Rotary and its partners use this data to create strategies to combat refusals, such as involving religious leaders to educate their communities about the importance and safety of the vaccine. #Hospital on wheels for patients in rural #Pakistan. ..digital disruption empowering rural women in Pakistan has been brought by RingMD, an international healthcare company headquartered in Singapore which is operational in 10 countries around the world. It came to Pakistan thanks to global healthcare sales specialist and now Country Head of RingMD Hassan Chattha. He realised it was needed most in Pakistan considering our local healthcare system is in doldrums. With 400 Pakistani doctors and 40,000 international doctors on board, this telemedicine platform allows doctors and patients to talk via phone or video call through a computer, tablet or smartphone even in low bandwidth environments. With a team of 30 in Pakistan, RingMD has been able to provide consultations to thousands of patients in rural areas around Lahore, Okara, Kasur, Bahawalpur, Sheikhupura, Rawalpindi, Faisalabad and Sargodha. After a positive response in Punjab, they have the support of Sindh government to start their operations in the province very soon. Before these WiFi-enabled mobile vans arrive to connect rural patients with city doctors, the company takes permission from the village leaders and explains the concept to them in detail. Once the leader agrees, influential people in the community spread the word through the mosque’s loudspeakers or share a place where the camp can be set up for maximum attendance. These influential people are essentially “enablers” for RingMD’s programs and once they see how the camps operate, they are then trained to carry out these activities independently for their villages. “We are also training teachers and educated young people to arrange tele-consultations. This way we are able to create new jobs and give confidence to people,” Chattha says. Most of all, RingMD provides privacy to female patients as they can sit alone in the van with a laptop and explain all their symptoms to a female doctor without any fear of being heard or judged by others. Shame is also a factor that restricts women in urban centres from getting treatment for their psychiatric problems in Pakistan and this is an area where RingMD can make a big difference by providing a range of mental healthcare professionals so that women are able to get treatment and support for taboo illnesses like stress anxiety and depression. In 2014, UNFPA – together with the Department of Health and Sindh Province’s Maternal, Newborn and Child Health programme – launched a pilot effort to supplement the midwifery courses with hands-on training. Midwifery coaches visited the midwives’ clinics, offering guidance and mentorship. But the midwives also faced challenges beyond education and training. In rural Pakistan, many people consider it shameful or unorthodox for women to work outside the home. According to a 2012 survey in Pakistan, 70 per cent of respondents said that when women work, their children suffer. Many of the midwives faced these attitudes, as well. Fozia Foto, 32, had the same experience in Hussain Khan Laghari Village. “I was the first girl who studied in my family and the first to become a midwife, so initially our relatives were against me,” she said. She stayed in hostels while enrolled in the midwifery school, which critics also used against her. “People said that I was living alone at the school and said so many bad things about my character,” she remembered. Community members were also sceptical of the midwives’ abilities. The midwifery school and coaching programme gave them the skills to save lives, but they were not always afforded the opportunity. “People didn’t trust me initially. Even for delivering babies, they didn’t refer cases to my birthing station,” said 30-year-old Reshma Korejo, from Meer Mohammad Korejo Village. She had to deliver two or three babies safely before she gained villagers’ trust. And as the midwives became established, they started changing minds, even raising awareness about issues that were not widely accepted – such as family planning. “There are myths in the minds of women,” said Ms. Ansari about contraceptives like the intrauterine contraceptive device (IUCD). Slowly, the midwives say, use of modern family planning methods is increasing. And they are also accomplishing the goal that motivated them in the first place: They are saving lives. Kousar Dahri, 32, remembered reviving a newborn baby in her village of Khamiso Khan Dahri. So far, over 300 midwives have benefitted from the coaching and mentorship programme. Plans are now underway to scale up midwifery training efforts. The 18-month midwifery training programme is being expanded to 24 months, with help from UNFPA. And the midwifery coaching programme will be rolled out to all the districts in Sindh through 2018. These programmes will empower more women to save lives. As for Ms. Dahri, she says the experience of saving that newborn stays with her. “Saving any child feels like saving all of humanity,” she said. Currently, there are 21 dedicated hospitals which treat only cancer where the bulk of the work centres around cancer diagnosis and treatment. Another 50 general hospitals have facilities to treat cancer with chemotherapy and/or radiation. These tend to be larger hospitals in major urban centres. Nationally, there are approximately 125 oncologists of all descriptions with some sort of post-graduate qualification practising medical and radiation oncology (17). Significant challenges exist for the future of oncology within Pakistan. Among the most serious are those related to training of physicians, nurses and allied technical staff. It has become much more difficult, in the last decade, for Pakistani physicians to train overseas, adding impetus to the need for well-designed and relevant training programmes within the country. There are currently insufficient numbers of training slots and a second fellowship means an additional two to three years of work at a relatively junior, and thus financially unrewarding, level. It is, nevertheless, essential that the number of training positions in the various oncologic disciplines be increased. Job opportunities within the country are also limited, particularly in the government sector hospitals, which have traditionally provided employment for specialist physicians. Only when we can provide adequate employment opportunities to our trained personnel can we hope to stem the continuous attrition of the country's trained workforce by employers overseas. The relatively small numbers of radiation machines and allied treatment facilities often mean that despite training in radiation oncology, radiation oncologists still have to practise largely as medical oncologists. Investment in infrastructure has occurred, as described above, and needs to continue. Over the last decade, 25 cobalt machines and 12 linear accelerators have been installed in government sector hospitals, while a further ten linear accelerators have been installed in private sector facilities. The costs of treatment of cancer continue to rise, coupled as they are to ever-increasing drug costs as well as the costs of improving technology, for both diagnosis and treatment. Over the last decade, the expense on cancer drugs has nearly quadrupled at the SKMCH&RC, partly due to increasing numbers of patients seen and treated but also because of the increasing availability of new and expensive cancer treatments. Interestingly, despite this huge overall increase in drug budgets, the institution has managed to keep the moving average price of high-cost cancer drugs stable by use of high-quality generic drugs as they become available, coupled with a decrease in price of drugs coming off patent. This represents an example of the kind of innovative strategies needed to be able to provide high-quality care to the maximum numbers of patients. SIUT (Sindh Institute of Urology and Transplant) Provides free medical treatment for kidney and liver diseases and cancers. It is a renowned center for ethical kidney transplantation. Our patients are predominantly from the rural and poorer urban strata with virtually no access to medical facilities. They are financially incapable of affording modern diagnostic, treatment and transplant facilities which are very costly in the private sector. In Pakistan since 2000, there has been the notable improvement in some health indicators mainly as a result of public, private programs and NGOs contributions . Despite, health profile of Pakistan is illustrated by high population growth rate, infant and maternal mortality rates, and dual burden of communicable and non-communicable diseases . Regardless, the country is undergoing considerable social, environmental, and economic changes. The basic food requirement and health are problems for the people, the paper by Nishtar  indicated that malnutrition is worst in the rural areas of Sindh, and Baluchistan with 20-30% children are being retarded, and high infant mortality is as a result of malnutrition, diarrhea, and pneumonia. Furthermore, about 40% of deliveries are attended by skilled birth attendants, and the high maternal mortality rate is related to high fertility rate, low skilled birth attendance, malnutrition and inadequate access to emergency obstetric care services . 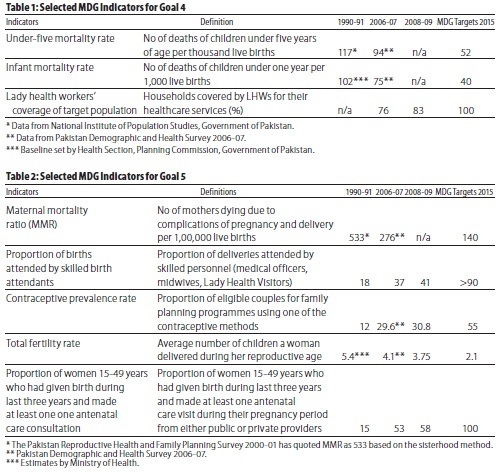 The key demographic and health indicators of both countries are summarized in Table 1. Bangladesh despite its challenging circumstances, has proven to be remarkably resilient and achieved significant human development gains, and impressive progress was made in health outcomes, especially in maternal and child health . Population growth slowed considerably during the past thirty years and falling from 2.7 percent per year in the 1980s to around 1.3 percent in 2010 . 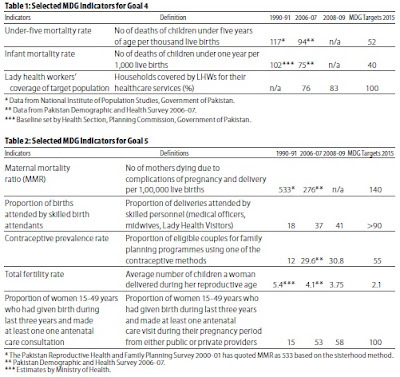 The contributions of the overall disease in terms of percentages in Pakistan and Bangladesh are shown in Table 2. Table 1: Key Demographic and Health Indicators. Table 2: Contributions of the disease. Since the time of independence, HCDS of Pakistan has undergone major reforms start its journey from National Health Policy, Primary Health Care services, TB control, and Immunization Program . Regardless of settled goal and expectations Pakistan health system showed dissatisfactory progress and failed to achieve desired outcomes . Furthermore, Pakistan failed to achieve goals of “Health for All” in Alma Ata Declaration and failed to attain Millennium Developmental Goals (MDGs) 2015. Currently, Pakistan is aiming to attain the Sustainable Development Goals 2025. In addition, Pakistan has also settled the National Health Vision 2016-25 to improve the health of all population particularly women and children, through universal access to affordable quality essential health services, and delivered through resilient and responsive health system. On the other hand, Bangladesh has surpassed many neighboring countries in South Asia as well as other developing countries in terms of progress in achieving the health-related MDGs. Similarly, Bangladesh also achieved significant progress towards achieving the twin goals of eradicating poverty and promoting shared prosperity 2007. Furthermore, Bangladesh became successful in achieving almost universal immunization coverage and reducing child and maternal deaths. Recently, Bangladesh has set National Five Year Strategic Investment Plan (SIP) in order to improve the health of the population, reforming the institutions, and improving performance. However, poor access to services, low quality of care, and high rate of mortality and poor status of child health still remain as challenges of the health sector of Bangladesh .